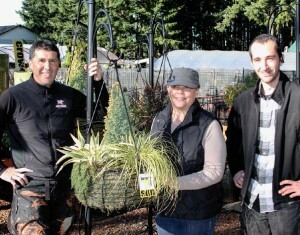 The Garden Corner owner Jonn “J-dog” Karsseboom (left) poses with employees Karen “K.T.” Tasker and Ryan “Sting” Krueger. The nicknames are part of the retailer’s unconventional culture, which differentiates the garden center and helps establish rapport with customers. Not too many garden center owners would refer to themselves as “J-dog” in their marketing materials — but then, Jonn Karsseboom isn’t most people. He’s a rebel business owner, unafraid to express his personality through his business, as well as his marketing. In fact, he views these things as a must. That’s why customers driving into The Garden Corner in Tualatin, Oregon, see a banner that reads “Welcome garden rebels!” It’s why the “World’s Largest Hanging Basket” is positioned at the center of his garden center. How do you attract customers in search of plants as a form of personal expression? For Jonn, the solution is simple. You create a garden center that celebrates personal expression — “the hanging basket passion place,” as The Garden Corner’s tagline puts it. Jonn’s “garden rebels” may include the college student with plants on the windowsill, the busy mom who loves plants but has little time to care for them, or the retiree who wants to grow better tomatoes. It’s because The Garden Corner provides customers not only with unique plants that exude personality, but also personalized help. Jonn’s passion for gardening began early in life. Growing up in Woodburn, Oregon, he and his brothers worked extensively in their home yard, thanks to the gardening passion of their mother, a registered nurse. But a nursery career did not become Jonn’s immediate pursuit. After high school, he decided he wanted to be a doctor and enrolled in pre-med courses at Portland State University. In 1991, Jonn and Tracey — with help from Tracey’s father, Jack Bigej — started a business installing and maintaining hanging baskets for the Lake Oswego Chamber of Commerce, which used them to brighten up shopping areas. While this business slowly grew, Jonn continued his education and made plans to apply for medical school. He was accepted by an out-of-state university, but didn’t want to move his family out of state, so he didn’t enroll there. Instead, he waited for Oregon Health and Science University in Portland to accept his application. “They just never did,” he said. About that time, S & J Nursery — located off the beaten pathway in a Tualatin residential neighborhood — came on the market. Jonn decided to give up his med school dream. The Karssebooms purchased it and converted it into The Garden Corner. “The problem with our business, and the people in our business, is we love what we do,” Jonn said. The hanging basket business was soon incorporated into the new garden center. Today, the baskets are grown at the garden center, then installed and watered from trucks that are emblazoned with The Garden Corner’s logo. “Pretty much, we now do the entire Portland metropolitan area in hanging baskets,” Jonn said. Jonn does not just advertise the slogan “the hanging basket passion place” — he lives it. When he’s in the garden center, he’s a constant blur, helping customers and making sure everything is in tip-top shape. When he leaves, he’s still engrossed in the business. A recent afternoon found him teaching primary school students about gardening. “Today, I can start first thing in the morning, and the day is finished before I even know it,” he said. It’s not to say that Jonn is not studious about what he does. He is constantly evaluating how The Garden Corner can better meet the changing needs of customers. The business has been there for 15 years, but he doesn’t view it that way. The Great Recession was tough. The Garden Corner was hit with a double whammy — the economy was in a shambles, and consumer shopping habits were changing. No longer did gardeners look first to garden centers for their plants. Jonn estimates that he lost 10,000 customers over a four-year period. “There’s a humbleness to knowing you’re their second choice, but there’s a hidden strength,” he said. It forces him to reach out, to compete harder, and to build relationships with his customers in any way possible — social media, personal interaction, you name it. Today, Jonn considers the recession finished, and over the past few years he has seen growth. It’s been slow growth, but he’ll take it. “Our story is one of immediate success, a horrendous storm, and then a slow revelation of purpose — a renewed sense of purpose,” he said.